This practice Lab is related to "CCNA VLAN Exam Sim". In this lab you have three Cisco Switches with different VLAN configured on these. Your task will be to troubleshoot and find the missing or bad configuration so that the communication between all these switches are possible in required way. A network engineer has built a Layer-2 switched network in a Healthcare IT company. But these are some misconfigurations. You are directed to verify these configurations and fix all the issues as per company's requirements. In Exam when you will analyze the configurations you may find the following faults or misconfigurations. You need to match the native-VLAN onboth end, you can use “show int trunk” command on Switch1 to check its native-VLAN. 2. Different Switchport mode on Switches: For making sure the correct trunk configuration you need to check that trunk port on both switch must be configured as trunk. For example first you can check that the E0/0 on SW3 and E0/1 on SW2 must be configured as trunk port. CCNA EIGRP AS Configuration Exam Lab: Your office has added a new router Router3 to current network. But there is some configuration issue between Router3 and the network, because currently no router is receiving the routing-updates from Router3. All other connectivity like ISP Internet is working fine. For troubleshooting the lab you need to check out the configuration on newly added router that is router3. Run the command show RUN on router3. 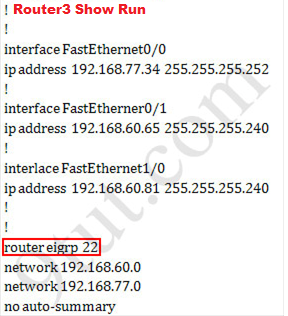 From the output of router3, we find that it is wrongly configured with an autonomous number of 22. If the AS numbers among the connected routers are different then no adjacency will be formed. You also need to make sure that you have the same AS on the entire router in the network. After the above configuration you will have the full connectivity. 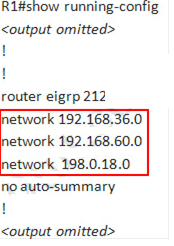 You should check again with ping command from router3 to other routers! Then we don’t need to change anything on ROUTER1 because the link between ROUTER1 & ISP doesn’t need EIGRP to run on it. There is a static router command ip default-network command in ROUTER1, this is correct so that all the routers can access the Internet. That all, thank you for reading. Share your comments and CCNA exam experience. Visit some other practice labs for CCNA. Gns3 1.3 x 32 bit Download: Today i download the gns3 after the long time but i shocked to see the message that "This version of GNS3 is not supported on 32 bit editior of windows. Please download GNS3 1.3.x". Then i googled the query and found that there is no more support for 32 bit operating system. GNS3 is an open source graphical-network=simulator that allows you to design complex network topologies. You can simulate or configure Cisco and other devices like workstations to powerful Cisco routers. GNS3 is based on Dynamips. I search the "Gns3 1.3 x 32 bit Download" for Download but no link found for download. So Guy if you have old version of GNS3 then please share the link. Or comment how we can try it on windows 7 32 bit.